Adding to the collection of amazing OpenStreetMap animations, the folks at Scout worked with the Ito World team to create a new addition to the “Year in Edits” series. Celebrating the 10 year anniversary of OpenStreetMap, the new video looks at the growth in OSM between 2004 to 2014 . As I’ve blogged before, I love these videos. The production quality is high, music is great, and they provide an easy way to communicate how amazing the OSM database has become. Kudos to all the volunteer mappers out there. 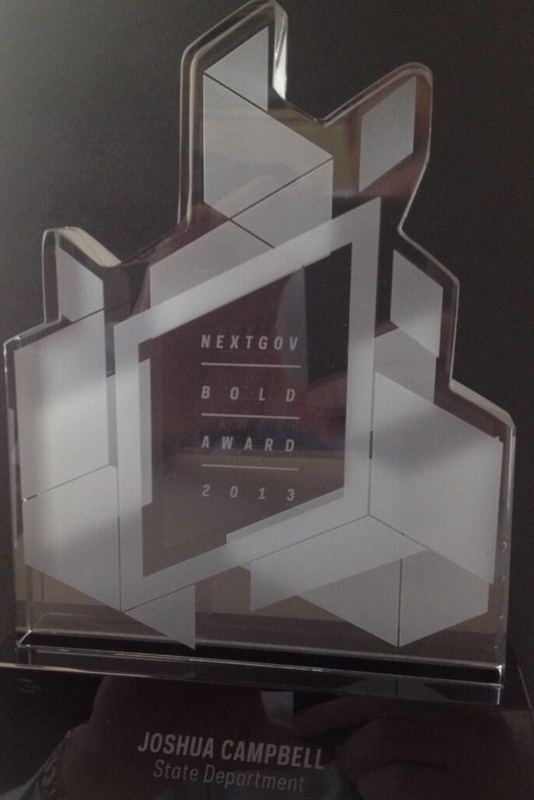 In 2013, the NextGov media organization began the Bold Award, given for innovation in Federal technology. It is an interesting award, as the idea of innovation in the government is usually the punchline of a bad joke. But the folks at NextGov are on to something, as innovation in the government is actually really difficult. Besides the usual set of restrictions (a stodgy, risk-adverse bureaucracy, broken acquisition processes, and woefully dated information systems), one of the challenges is measuring the impact of an innovation. In the private sector, a financial metric like Return on Investment (ROI) is a visceral and quantifiable measure of success. Usually a product is built to fill a gap identified in the market. In order to manage the risk of launching a new product, a protoype is built, beta tested, feedback from the market incorporated, and a revised prototype is built. Wash-Rinse-Repeat till the product makes money, or the underlying assumptions are proven wrong and development stops. For several reasons the notion that an innovation could be proposed, implemented, measured, iterated, and the team rewarded for success does not translate to government. First, success is difficult to quantify, let alone tie back to specific actions. In the context of the HIU, what is the value of informing a policy maker better? How do you measure a good decision? How do you know its a good decision when you can’t know the alternative? When trying to build something like Imagery to the Crowd or the CyberGIS, how can I measure the impact on foreign policy? When a decision is ultimately made, it was on the basis of multiple streams of information, how do you determine the value of a single product? This situation is not unique to government, but the government does introduce some unique dynamics. Second, there is no incentive to reduce cost. A culture of “we have money at the end of the year” means dollars get spent by years end, often regardless of utility. So if you actually save money, the bureaucracy figures you can do your mission for less and cuts your budget. This is a sentiment that is counter-intuitive at best, criminal at worst. Third, the broken acquisition systems means that there is no way to fund an agile approach to product development in the government. Implementations of “minimal viable product” and rapid prototypes are a rare occurrence in the government. Instead, innovation must follow a procurement process where the innovator has to determine “requirements” (a mind-numbing process), put it out to bid (a mind-numbing process), idea awarded to low ball estimator, it gets built (maybe correctly), and two fiscal years after you started, you have some implementation of your innovative idea (that you have to pay extraordinary costs to the original contractor to change). Not a recipe for success. We know government bureaucrats work for the citizens (something I was proud to do), and that they have a duty to reduce costs and increase the quality of services delivered to/for citizens. However, the system is broken when the momentum behind keeping the status quo in place massively overwhelms the need for change. So what exactly is the motivation for a government employee to be innovative? We know its not money, as innovators are worth significantly more in the private sector. From my experience it comes down to the fact that people care. Yeah, not usually a thought that people use to describe government bureaucrats, but it’s true. There is a tremendous amount of talent and willingness to work hard in the government workforce. The problem is they are shackled, and the cost to be innovative is a personal willingness to put themselves at risk and continually run through bureaucratic walls. As documented by the Washington Post lately, the government is losing the next generation of leaders because of this nonsense. So back to the idea of awarding innovation in Federal technology. As part of the NextGov inaugural class, I was nominated and awarded a 2013 Bold Award for the Imagery to the Crowd initiative. This was an honor to win, but also disingenuous in that it would not have happened without a crew of people. Those folks at the HIU and elsewhere know who they are and the key role they played. Gratitude. #oMC. The 2014 Bold Award winners are listed here. Back in March 2014, FCW published two articles written by Frank Konkel that mentioned the HIU’s work with digital mapping. The first, entitled “Why Maps Matter“, is a good summary piece that reviews how geographic technology is used in various U.S. government agencies. The key points are the growing recognition in the government that visualization is a powerful tool for policy making, and how new companies are making it significantly easier for new users to leverage geographic technology. Beyond discussing the HIU, case studies from the Federal Communications Commission (FCC), Capitol Hill, National Park Service (NPS), and the National Geospatial-Intelligence Agency (NGA) are mentioned. The second article, State Department: Mapping the humanitarian crisis in Syria, is a shorter piece that focuses solely on the HIU and its work in mapping the Syria humanitarian crisis. Having worked closely on Syria for two years, I can say we put a tremendous amount of effort into building comprehensive refugee datasets, verifying data from news reports, NGO reports, and commercial satellite imagery. Additionally we built inter-agency compatible data schema that leveraged geographic locations and P-Codes for information integration (P-Code dataset, P-Code Viewer). And to visualize it all, we built custom web mapping applications with tools to interactively explore all of the data across time and space. A significant portion of the HIU work on Syria (and now Iraq) is available on the HIU Middle East Products page, additionally, the data used for the Refugee and Internally Displaced Peoples layers are available for download on the HIU Data page. It is clear the appreciation and value for geographical data, analysis, and visualization are on the rise; FCW lists the the Why Maps Matter article as the 3rd most popular of 2014. Fully recognizing the value of geography requires that the notion of maps as “pieces of paper” must be replaced with an appreciation and use of geographic data and spatial analysis as a tool of policy formation. This change is happening, albeit slower than I’d like, but its adoption will result in better, more agile policy, and benefit the government and citizens alike.